This fantastic Octagonal model from Hercules is sure to make a centrepiece in your garden, especially in the new colour of Old Cottage Green. The Octagonal design makes your greenhouse environment suprisingly efficient as you aren't wasting a large part of the area in path. You can also add the optional high level shelves to make even more useful space. Please note that the bottom door track needs to be supported by the level base as it protrudes proud of the greenhouse footprint. A = Base width: 1,910mm (6ft3). B = Length: 1,910mm (6ft3). C = Eaves height: 1,854mm (6ft). D = Ridge height: 2,520mm (8ft3). E = Door width: 741mm (2ft5). 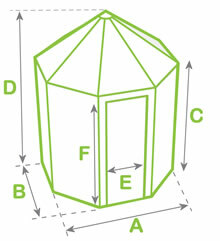 F = Door height: 1,764mm (5ft9). Ask a question about "Hercules Octagonal 6x6 Old Cottage Green"
I wanted a greenhouse which looked good too. This greenhouse fitted the bill exactly. The delivery was quick from ordering, all pieces were present and there were no damaged parts or glass. It can be delivered if you're not going to be at home when the delivery is scheduled. It took a couple of days to erect and the instructions were very easy to follow. I also purchased the extra high shelves and the automatic louvre openings. I'm so pleased with the quality and the design. Perfect for someone who wants to potter around and grow their own flowers, plants and veg from seed. Thank you Greenhouse People. I would definitely recommend this product and your company. Write a review of "Hercules Octagonal 6x6 Old Cottage Green"